This past March I was struck by the worst tree allergies I’ve experienced in 20 years – possibly more. We had been camping in a wooded area for about a week when, all of the sudden, I was sneezing, coughing, and waking up with a sore throat. One morning I couldn’t even talk. Angela thought that was great. Anyone with serious seasonal allergies knows the first rule is to stay inside with the windows closed up. If it’s hot outside, air conditioning is the best bet. Being outside, or having the windows open, is a classic allergy no-no. In the days leading up to my allergy attack, we had the camper windows and rear door wide open with the Fantastic Fan producing a wonderful breeze through the camper. Only later did we realize that this had invited enormous amounts of horrible tree pollen into our camper. Even with the windows and door shut tight and the air conditioner on, my allergy battle was unabated. After purchasing the latest allergy medications – Zyrtec and Nasacort – my condition improved a little, but something more had to be done. Then it hit me. “We need to clean the living daylights out of this camper” I said to Angela. “Let’s wipe down the cabinets, walls, ceiling, and floor. The bedding needs to be taken to a laundromat and anything that’s cloth or carpet needs to be vacuumed into submission.” Angela had never had allergies before, but she too was starting to get watery eyes from the invisible tree pollen. Time to put a plan into action. Our usual pattern for purchasing just about anything is to research the product to death on the internet. We’ll read Amazon reviews, look for forum posts, and even study manufacturer websites. Not this time. This time we went to the closest store with vacuum cleaners – Walmart – looked at what they had available, and picked one on the spot. 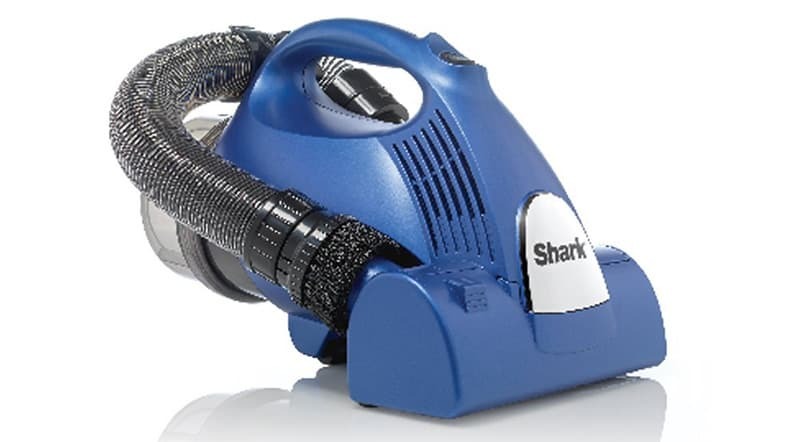 Our selection was a Shark Bagless Hand Vac, model V15Z. The Shark V15Z featured a motorized brush, crevice tool, and dusting brush. Most importantly, the Shark had a HEPA filter for allergens, and plugged into 110 volt for stronger-than-cordless suction. We didn’t go for a cordless model as I wanted the strongest vacuum possible, and many cordless models lacked the all-important HEPA filter. Making our decision even easier, the cordless models cost more. About three hours later, Angela and I had swept, vacuumed, and wiped areas of our truck camper interior that probably hadn’t been considered since the date of manufacture twelve years ago. What was most shocking was the sheer amount of dirt this voracious sweeping, vacuuming, and wiping produced. We think we’re relatively clean people, but the amount of dirt we removed was a bit disturbing. To be fair, some of this dirt probably belonged to the folks before us, but that’s not exactly comforting. Finally, we bought a small Honeywell air filter at Home Depot. The Honeywell is designed to filter 155 square feet of air, and contains two air filters; a charcoal filter, and a HEPA filter. With the cleaning completed, we placed the air filter on the camper kitchen counter, and let it rip. Two days later, my allergies were all but gone. The allergy medicine, deep clean, and air filter had worked. With near perfect timing, TCM reader Dennis Link sent in a Question of the Week suggestion on vacuum cleaners. He asks, “What’s the most powerful, durable compact vacuum cleaner on the market? Every one I have tried has malfunctioned in a short time.” Well Dennis, we really like our Shark V15Z so far, but let’s find out what our readers have to say. Click here to see vacuum recommendations from TCM readers.